Italian dictator Benito Mussolini committed troops to the war on the Eastern Front. The most successful Italian Army of World War II was a political creation of dictator Benito Mussolini. Il Duce desired to participate in the fascist dream to eliminate Bolshevism. Although heavily engaged in North Africa, the Balkans, and East Africa, Mussolini forged an expeditionary force to fight in Russia alongside the Germans and other Axis satellite forces. This unit, the Corpo Spedzione Italiane in Russia (CSIR) became the most successful Italian army in the war. This army advanced the greatest distance, more than 1,100 kilometers, earned the most victories, and lost just two battles. But like many armies before it, the Italian force was swallowed up in the vast winter landscape of Russia and has been forgotten by history. As soon as Germany officially informed Mussolini of the invasion, Mussolini told his foreign minister, Galeazzo Ciano, “We must be present on the Russian Front as soon as possible!” Mussolini even named the commander of the CSIR, General Francesco Zingales. In an official letter to Hitler, Il Duce offered Italian forces. He wrote that the Italian expeditionary forces would perform well because his soldiers never fought better than when they were fighting against the Bolsheviks. After heavy negotiations by Ciano, on June 30 Berlin officially transmitted to Rome the invitation to participate in the campaign in Russia. The Corpo Spedzione Italiane in Russia had a strength of 62,000, with two nominally motorized infantry divisions of the old 1938 binary type, the 9th Pasubio and 52nd Torino. The 3rd Celere, a cavalry division partially converted to a motorized division, the 30th Artillery Regiment, and the 63rd Motorized CCNN Legion of the fascist blackshirt militia completed the corps. The Italian Air Force, Regia Aeronautica, supported the expeditionary corps in the Russian campaign. The headquarters was established in Turdora and consisted of the 22nd Gruppo made of four fighter squadrons, the 359th, 362nd, 369th, and 371st, and the 61st Gruppo of three bomber squadrons, the 34th, 119th, and 128th, a total of 83 planes. The Italian Air Force contingent remained with the Italian ground forces during the entire campaign. Mussolini inspected the first units to leave at Verona on June 25. He inspected more regiments leaving for Russia on July 29 at Mantua. “Verona became the launching pad to Russia,” wrote Santi Corvaja. “From that railway station, 225 trains took the 62,000 soldiers, 5,500 cars and trucks, 4,600 horses and mules, and tons of supplies over a distance of 2,300 kilometers up to the Romanian border.” Surprisingly the first contingent of Italian forces to reach the front was a flotilla of MAS torpedo boats and six midget subs. The units of the CSIR embarked upon trains and traveled through Austria and Hungary and reached their assembly areas in northern Romania. The Pasubio (9th) Division left first on July 11 and arrived at Suceava, Romania, on July 17. In transit, General Zingales became ill and had to be replaced. Cavallero suggested General Giovanni Messe to Mussolini. Messe had led the Italian Mobile Corps during the invasion of Yugoslavia. Messe joined the CSIR on July 17 in Marmarossziger, Hungary. The soldiers began the campaign with high morale. Because of the high degree of mobility for Italian units, greater than the German infantry units, even the Germans were impressed. The division was joined by the 1st Bersaglieri Motorcycle Company and two 105mm artillery battalions of the 30th Artillery Regiment. The Italian force went into action on the 10th. The advance guard, 1st Battalion, 80th Infantry Regiment and 1st Bersaglieri Motorcycle Company conducted the action as the force swept south along the river through Pokroskoze and sealed off the last crossing point at Jasnaza Polzana. Strong Soviet rearguard action enabled some Soviet forces to escape. The Italians called the action the Battle of the Two Rivers, which cost them 15 killed and 82 wounded. Proud of his units, Mussolini flew to Russia to review the Italian division. The Italian home front saw this historic Italian military accomplishment as Mussolini and General Messe were photographed standing on Russian soil some 400 miles inside the Soviet Union. The Italian units became the spearhead of an entire group of German armies. The corps as a whole participated in the general advance to the Dneiper River, taking up positions between Oerizevka and Dneipropetrovsk by September 17. The Torino Division finally caught up after its 800-mile march. By the end of September, the Italian troops moved across the Dnieper and reached the Orel River. The CSIR was ready to conduct its first corps-level encirclement. Mussolini’s commitment on the Eastern Front had personal ramifications. He had already lost his eldest son, a pilot, to the war. Now his daughter, Edda, wife of Count Ciano, Italy’s foreign minister, volunteered for Russia as part of the war effort. Edda Ciano joined the Red Cross and worked in an Italian Army hospital at Stalino nearly 600 miles into Soviet territory and only 100 miles from the furthest point the Germans had reached at Rostov. The CSIR pushed eastward for the next three months, fighting battles at Pavlograd, Gorlovka, Rykovo, Nikitovka, and Chazeptovka. The advance reached the headwaters of the Muis River in late December. The 63rd CCNN Legion bore the brunt of the fighting. During this phase the unit lost 126 killed, 262 wounded, 279 to frostbite, and 92 missing from a force of 1,500. On December 26, the Italians fought what they called the Christmas Day Battle. The Soviets launched a six-division attack on the Axis Muis River line. The Russians broke through German-Italian lines forcing the bulk of the 3rd Celere Division to fall back and form isolated pockets of resistance. 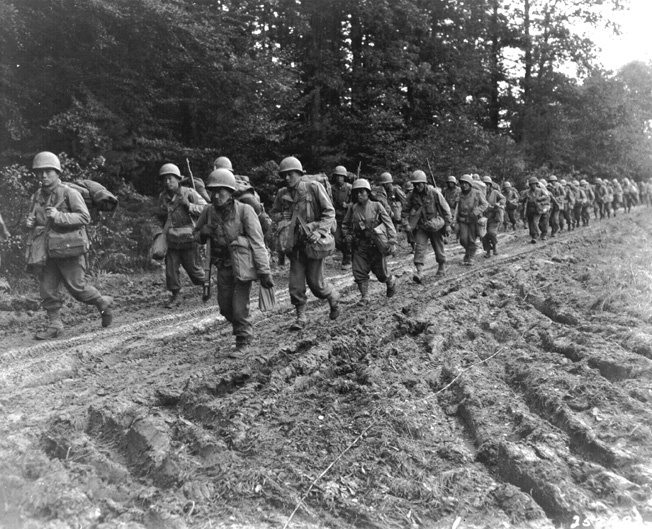 A coordinated counterattack by the Torino Division and the German 318th Infantry Regiment recovered the ground and rescued the 3rd Celere Division. Four Soviet divisions were trapped and forced to surrender. In this action, the Italian corps lost 168 killed, 715 wounded, 207 missing, and 305 frostbite cases. An Italian cavalry unit charging through the steppes of Ukraine, Summer or Autumn 1942. As winter set in, the soldiers had to wage a battle of survival with nature. During this time the Italian high command and General Messe took stock of the CSIR performance. Their report highlighted successes in the field despite inadequate leadership, poor armor, lack of mechanization, and a shortage of artillery and antitank weapons, revealing the CSIR to be ill-equipped for the nature of fighting on the Eastern Front. Deficiencies in communication, logistics, and winter uniforms also sapped the morale and fighting power of the Italian force. The CSIR was hindered by a poor logistics system and incredible inefficiency. For example, the multiplicity of different truck types, 17 light and 30 heavy, taxed drivers and technicians and made it impossible for an adequate flow of supplies. Knox also points out that “the War Ministry failed to provide units in Russia with low-temperature lubricants for vehicles and weapons.” Combat units were perpetually short of fuel, ammunition, water, food, vehicles, weapons, and even manpower. Even if food was available, hot or prepared food was still a question given the primitive state of wood-burning stoves in field kitchens. Italian equipment proved to be totally obsolete. The Italian armed forces had been the first European power to complete a rearmament cycle in the late 1930s, and by the early 1940s Italy was industrially incapable of supporting an upgrade. The main battle tank, the M13/40, was no match for the Red Army T-34 and never served in Russia. The CV 33 tankette was the equivalent of the Bren Gun carrier. A light tank, the Carro Armato L6/40, arrived in small numbers in 1942 and 1943 but weighed only 6.7 tons and carried a 37mm gun. Unprepared for armored warfare, the CSIR accepted in large numbers the Polish Marosczek WZ35 antitank rifle from the Germans’ collection of war booty. A major weakness noticed by commanders at all levels concerned inadequate training and tactical philosophy. This was never rectified and would prove fatal during the later retreat from the River Don. Like the German Army, the CSIR was sent to fight in Russia with little special equipment or clothing suitable for the severe conditions that they would encounter. Most of the men went to the Eastern Front wearing only the regular issue pantaloons or breeches which, although made of wool, went only to just below the knee. The bottom of the legs were covered with socks and hobnailed boots. In the subzero temperatures of winter both proved to be totally inadequate. Corruption in the procurement and distribution of supplies among the Italian Army, government, and business exacted an enormous cost. Equipment ranged from inferior to unusable. Knox noted, “The troops were perpetually short of the small items that made the difference between discomfort and despair: buttons, threads, needles, razor blades, envelopes, writing paper, postcards, pencils, and rank and unit badges.” Ultimately the Italian units depended on Romania for food and fuel. The relationships between the German and Italian armies and the inhabitants of the conquered Soviet territory differed greatly. The Germans made a major mistake alienating the Ukrainian people. The Italians did their best to maintain good relations with them. 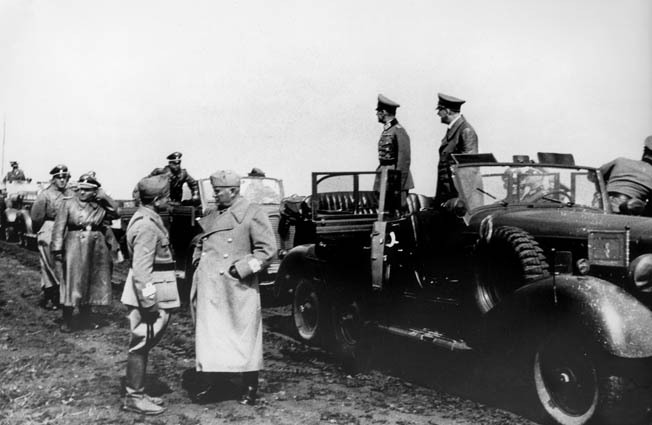 Benito Mussolini (foreground, center) speaking with commander Giovanni Messe, with Adolf Hiter (right) and field marshal Gerd von Rundtstedt in the truck beside them, during the inspection of Italian units near Uman (south of Kiev), Ukraine. At left is Nazi official Martin Bormann. Photograph, 28 August 1941. Italian Alpini soldier Tullio Lisignoli recalled his first Christmas in Russia and his experience with the Russian people: “We Italians decided to celebrate the upcoming Christmas season with a large Mass. It was too cold to hold the ceremony outside, so we decided to dig an underground church. We started to dig the hole and after a while some Russian civilians asked us what we were doing. We told them we were digging an underground church. The next day there were more Russians than Italians helping with the digging as they wanted to celebrate Mass as well, so our officers gave them permission to attend. Into this logistical mess, Mussolini desired an expansion of the CSIR. Partially because of the success in Russia already achieved and partially because of the backseat his troops had taken in North Africa, Mussolini believed a larger commitment of Italian troops in the East would enhance Italian prestige. He requested that Cavallero commit 20 new divisions to the Eastern Front. However, Cavallero realized the potentially catastrophic consequences of diverting forces from North Africa and attempted to reduce the expansion to six divisions. Italian King Victor Emmanuel’s disapproval did not hinder Mussolini. In November 1941, Hitler, with his army stalled in front of Moscow, accepted Italian Alpine divisions for the future drive on the Caucasus. Mussolini met with Hitler at Castle Klessheim in Salzburg on April 29-30, 1942, to discuss the next summer offensive. Hitler was extremely complimentary of the Italian performance in the initial invasion. Hitler said that the Italian soldiers had fought magnificently, had bravely endured all the hardships of the winter, and were fighting valiantly at the side of the Germans in Russia. Eventually, Mussolini sent 200,000 men to the Eastern Front in the form of two corps, the Alpini Corps and II Corps, and additional support units. After the experience of the Russian winter Mussolini wisely chose specialized units. The elite Alpini units were added to the strength of the CSIR because of their expertise in harsh winter climates. Three Alpini Divisions, the 2nd Tridentina, the 3rd Julia, and the 4th Cuneense, formed the corps. Alpine regiments were elite forces that received the best possible supplies, equipment, and officers. The II Corps consisted of regular infantry divisions, 2nd Sforzesca, 3rd Ravenna, and 5th Cosseria. These were professional units of the peacetime army, the best line infantry formations in the Italian Army. One additional infantry division, the 156th Vincenza, became the army reserve and was assigned to protect the lines of communication. Commando Supremo decided to complete the motorization of the 3rd Celere Division. To accomplish this, they dispatched to Russia a motorized artillery regiment, a second motorized Bersaglieri infantry regiment, a motorized mortar battalion, and another Bersaglieri motorcycle company. These replaced all the horse elements to form a division similar to the German light division of 1939. General Messe formed the horse units into a rear guard security unit called the Balbo Cavalry Brigade, which remained on the Eastern Front for the remainder of the campaign. Messe was transferred to Tunisia, where he commanded the Italian First Army and was taken prisoner. Later Messe joined the Italian forces on the side of the Allies in 1943 and fought against the Germans and Mussolini’s Italian socialist state. Joint German and Italian troops in a trench in anticipation of an attack in Russia. Photograph, Autumn 1941. From January through July 1942, the Eighth Army built up to 270,000 men while it held defensive position against Red Army probes. The Italian Expeditionary Forces reached significant number in artillery, but armored vehicles remained few in number. The Italians fielded 946 artillery pieces in 204 batteries, 387 antitank guns, 276 antiaircraft guns, 1,297 mortars, and 1,742 machine guns. The armor element included 55 light tanks, 30 armored cars, and 17 assault guns. The motorized force moved with 16,700 trucks, 25,000 horses and mules, and 4,470 motorcycles. In May, the Italian Air Force contingent was reduced to 66 planes. On July 11, 1942, the 3rd Celere Division launched the Italian Army’s summer offensive against the town of Nikitino. The troops broke through the Russian line, and a force from the Bersaglieri Regiment exploited the breach to reach Petrovenki. By July 14, the 3rd Celere Division occupied Ivanokia, with the rest of the Italian forces moving forward in preparation for the coming battle of Krasny Lutsch. The XXXV Motorized Corps and II Corps launched the encirclement of Krasny Lutsch on July 17. The 3rd Celere and 9th Pasubio struck from the north while the 2nd Sforzesca and Balbo Cavalry Brigade assaulted directly. In three days the Italians captured the city and pursued the retreating Soviets. The 3rd Celere had the highest casualties with 83 killed, 542 wounded, and 10 missing. By August 20, the Eighth Army, reinforced with the German XXIX Corps, defended the Don River line from Pavlovsk to the Choper River, a front of about 200 kilometers. The Russians struck the Axis flank in an area defended by the Italians. During the First Battle of the Don the Italian divisions held their ground for 11 days. The main weight of the Soviet attack landed on the 9th Pasubio and 2nd Sforzesca Divisions. The Italians stood their ground. As MacGregor Knox wrote in Hitler’s Italian Allies, “The troops did not show the readiness to surrender of popular legend. The units in Russia held together in conditions—usually deriving from the army logistical inadequacies—that would have caused soldiers of the industrial democracies to quail.” No Soviet penetration was achieved in those 11 days. On August 24, the 3rd Savoy Cavalry Regiment of the Balbo Brigade counterattacked the Soviet 812th Infantry Regiment reinforced by a battalion of field artillery as the Communists neared a breakthrough in the 3rd Celere lines. At Izbushensky, the Italian Dragoons attacked with saber and hand grenade. Four days after the battle the Alpini Corps arrived, followed in September by the Montebello CCNN Regiment and the 156th Vincenza in October. 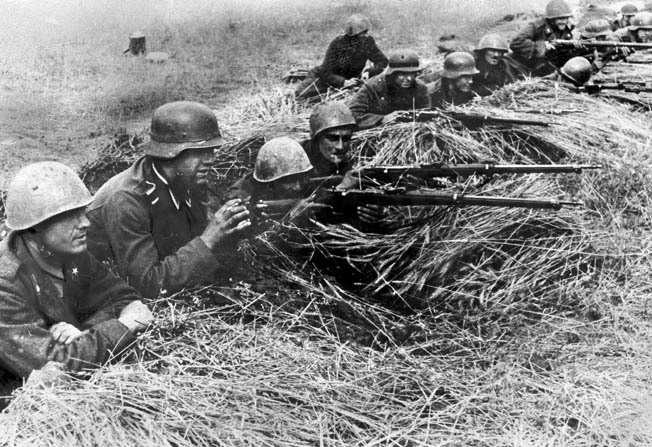 The Eighth Army was told to hold its ground while the German Sixth Army struggled for Stalingrad. Meanwhile, the Italian Army reached a strength of 7,934 officers and 210,682 men and prepared for a second winter in Russia as it screened the northern flank of the German offensive. The Italians were in a vulnerable position as a result of German command decisions. “The Germans imposed on the Italian Army an overstretched cordon deployment that Russian armor would rip to shreds,” noted Knox. Covering a 250-kilometer front from Babka in the north to Vescheskaya in the south, the Italian headquarters realized they were too thinly spread. Using all expediencies, the Eighth Army formed two volunteer units from occupied nationals. Like the Germans, the Italians recruited from Croatia and formed the Croatian Legion, which consisted of an infantry battalion, a mortar company, and an antitank company. The Italians also recruited a small unit of Cossacks, which consisted of a colonel, four officers, and 360 Cossack troops and was attached to the Norvaria Cavalry Regiment. The Soviet Winter Offensive, known to the Italians as the Second Battle of the Don, began with Russian probing attacks on December 1, 1942. The Italian Eighth Army faced the Soviet 1st Guards Army, one of the Russians’ best. The Don River froze, and the Soviets built crossing points in front of the II Corps and XXXV Motorized Corps sectors. On December 11 the 3rd Ravenna Division was hit by a Soviet attack but held. On the 16th of December the Russians launched their main attack on the Italian lines with 425,000 troops supported by 5,000 guns and 1,000 tanks. A major Soviet penetration occurred on the 19th when a second Soviet Army smashed through the Rumanians and overwhelmed the Italians. The bulk of the Pasubio, Ravenna, and Torino Divisions, the German 298th Division, and the 3rd Gennaio CCNN Brigade were surrounded in the area of Tschertkovo, fighting on for three weeks before surrendering. Nevertheless, Mussolini’s commitment in Russia had come to a tragic end. The remnants of the Italian Army in Russia withdrew to the Donets River south of Belgorod, which they reached on January 31, 1943. By the spring of 1943, almost 60 percent of Mussolini’s expeditionary force was gone. During 20 months of combat on the Eastern Front, the Italian Army lost 3,010 officers and 81,820 men killed or captured, as well as 1,290 officers and 28,400 men wounded of frostbitten. During March 1943, all Italian units serving on the Eastern Front were transferred to Italy for reforming and reequipping; however, they never returned to Russia. The heavy losses of the 3rd Alpini Division are indicative of those suffered by Italian units in combat against the Red Army. The division set out for Russia with 16,000 men and 4,000 mules and returned to Italy with 3,200 men and 40 mules. The CSIR served in the East with honor and fortitude. However, the finest army Italy fielded during World War II was swallowed up in the vastness of Russia. Tags Allies, Axis, Benito Mussolini, corpo spedzione italiane in russia, Eastern Front, Gerd von Rundstedt, German Eleventh Army, German Sixth Army, Giovanni Messe, Italo Gariboldi, Martin Bormann, Operation Barbarossa, Regia Aeronautica, Stalingrad, Victor Emmanuel.